FREE SHIPPING!! DUAL BAND!! DUAL SPEAKER!! DUAL OUTPUT!! CROSS-BAND REPEATER!! SPECIAL - 220 MHZ VERSION ONLY $209.00!! The Wouxun KG-UV920P-A is a Dual Band UHF/VHF base/mobile two way radio loaded with powerful features at an affordable price. With 40 watts UHF and 50 watts VHF, the KG-UV920P-A provides the RF carrier power of a high end portable handheld without the high end cost. The KG-UV920P-A features twin band simultaneous reception, dual speakers and dual output. isn't just a radio, it's also a full duplex cross-band and cross-band mobile repeater! Also available in a 2 meter/1.25 meter version! The Wouxun KG-UV920P-A is a Dual Band UHF/VHF base/mobile two way radio loaded with powerful features at an affordable price. 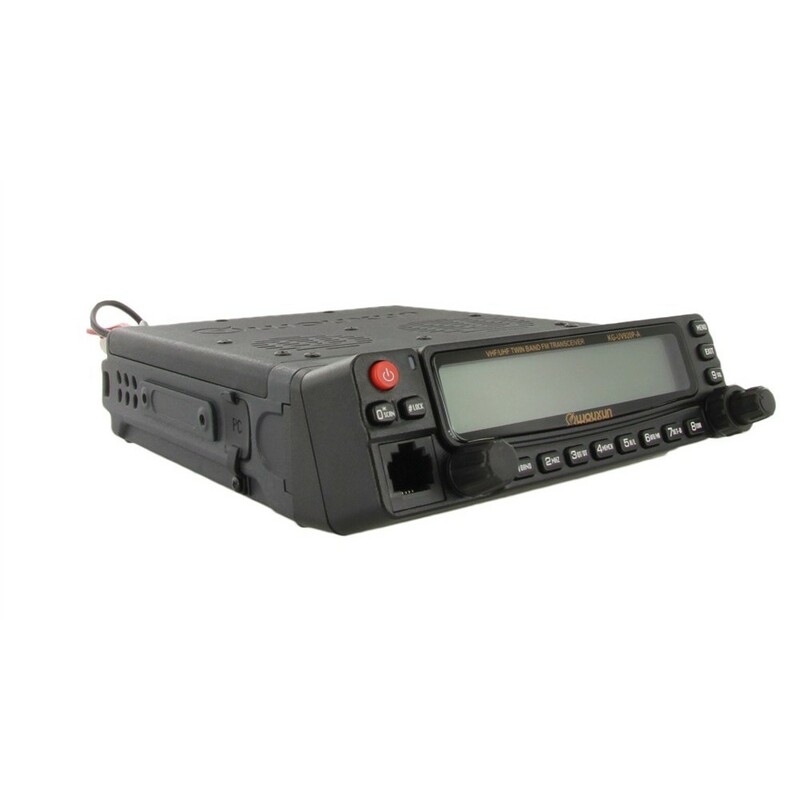 With 40 watts UHF and 50 watts VHF, the KG-UV920P-A provides the maximum power of a mobile radio without the maximum cost. 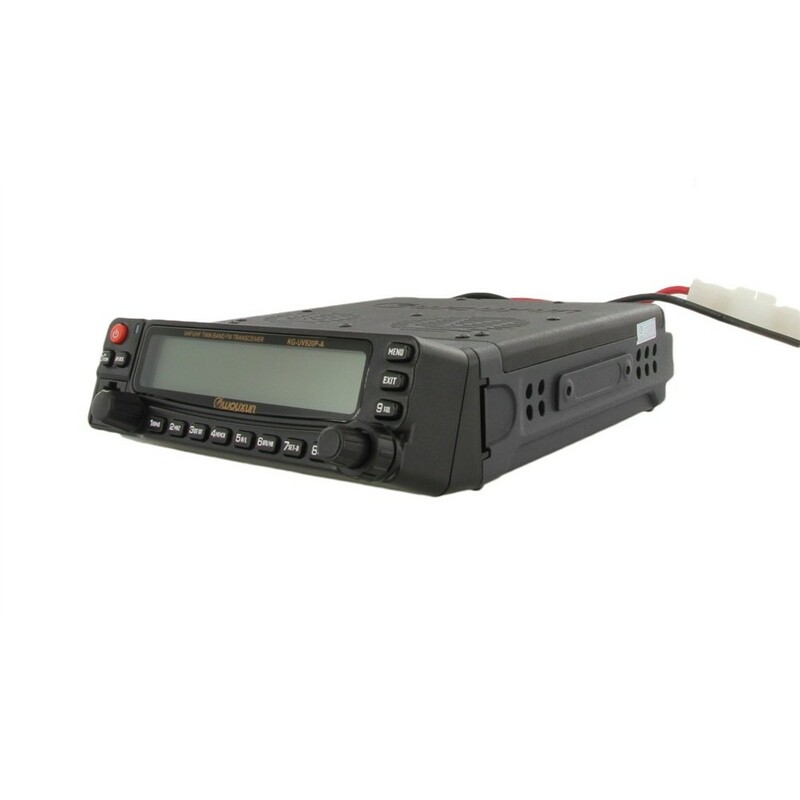 The KG-UV920P-A features 999 programmable memory channels with CTCSS and DSC encode/decode, DTMF encoding/decoding, priority channel scanning, and twin band simultaneous reception. It's bandwidth selectable, allowing you to select wide or narrow bandwidth at the press of a button. Bands can be freely set on the same channel for VHF TX-UHF RX or UHF TX-VHF RX. It's power selectable as well, with allowing you to select the output power to high. medium or low. Think that's powerful? It's only the start. The KG-UV920P-A isn't just a radio, it's a full duplex cross-band and cross-band mobile repeater! 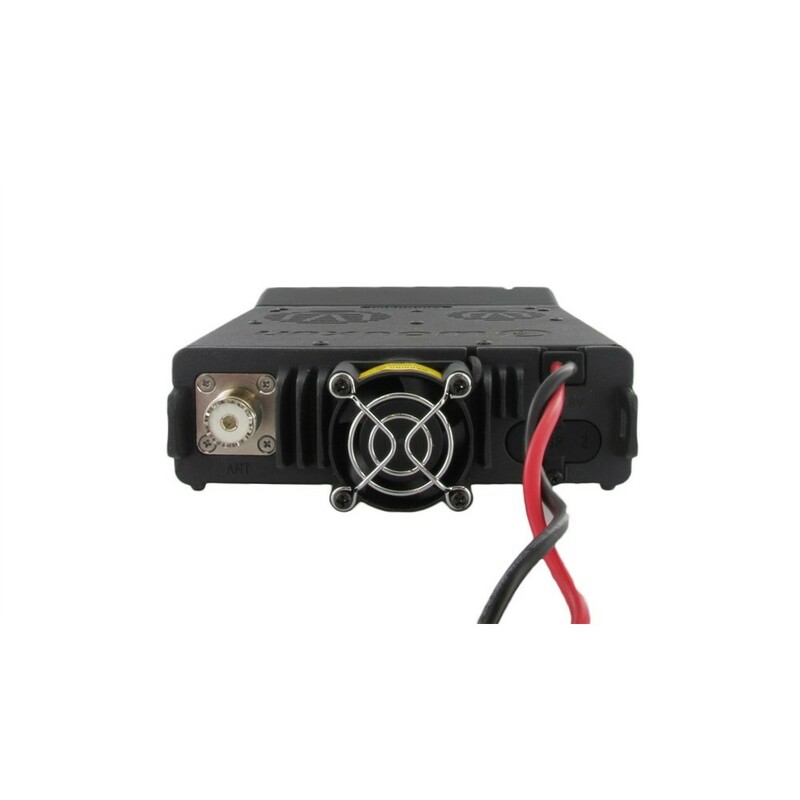 Choose from five repeater settings - normal radio mode, directional cross-band repeater mode, two way cross band repeater mode, repeater receiving mode (receiver) or repeater transmitting mode (transmitter). You can connect two units together using the 5m extension cable or the microphone connection cable (both included) to set up your own working repeater. Impressed? Well, listen to this. The KG-UV920P-A also has dual speakers built right into the chassis with multiple speaker channel settings plus an additional speaker built into the DTMF hand microphone. This gives the UV920P-A a total of three supplied speakers! But wait, there's more. 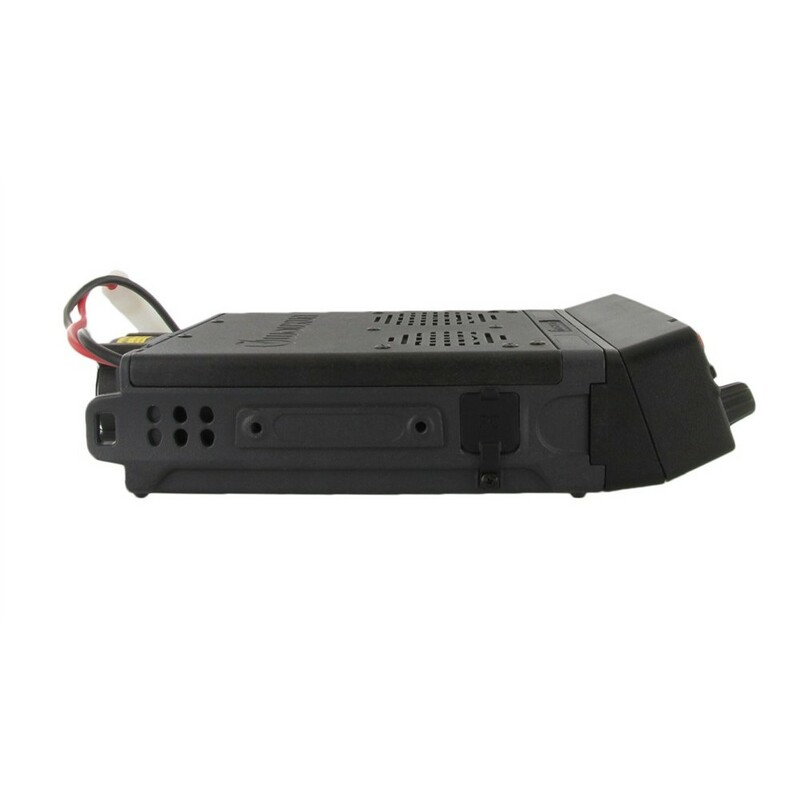 Channel Name edit and display, 76-108Mhz FM radio, 1750Hz burst tone, group calls, 8 group scrambler, low voltage voice prompt, stun and kill function, reduced noise settings, remote control setting and a built-in cooling fan are all included in this package. That's not all. Wouxun has built in a large, dual frequency LCD display with a 3-color selectable backlight in blue, green or white. The backlit buttons on the front panel help you see them in the dark. The full featured keypad on the handheld speaker mic is also backlit and voice prompts assist you with menu navigation. The front panel isn't just functional, it's also customizable! The KG920UVP-A includes two kinds of switchboard panels to suit your needs. Choose from an upward facing inclined panel or a flat panel for installation in your vehicle. The front panel as detachable and can be relocated separately from the radio chassis. The included 14 foot extension cable allows you to install it just about anywhere in your vehicle so you can have it right where you need it. The KG-UV920P-A can also be powered by the optional Wouxun SPS30WIN Power Supply to turn your twin band mobile receiver into a fully operational base station! 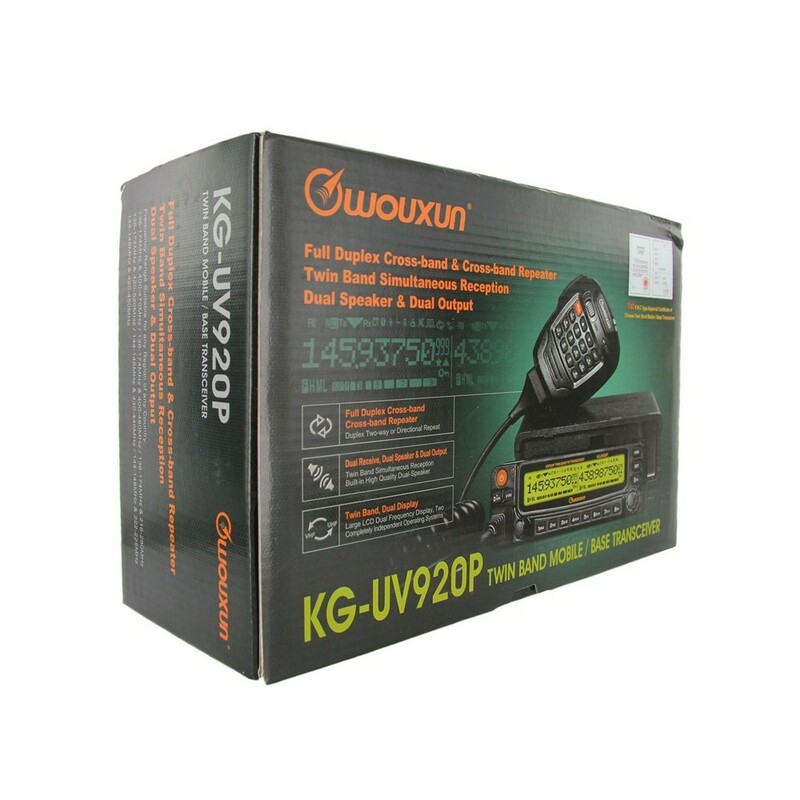 The Wouxun KG-UV920P-A comes with hand microphone with speaker, inclined switchboard panel, flat switchboard panel, mobile mounting bracket, remote front panel bracket, mobile power cord, 14 foot extension cable, hand microphone hook, fuses, screw set, an owner's manual and a one year manufacturer warranty from Wouxun. NOTE: The 1.25m (144-148/222-225MHz) version has a minimum 5kHz step. The 2.5kHz step is only available on the 2m/70cm (144-148-420-450MHz) version. For your convenience, an optional USB programming cable (Model PCO-003) is available to program the Wouxun KG-UV920P-A from a computer. NOTE: When you purchase this programming cable, we will include the USB cable driver and programming software on mini-CD. Ham Radio Starter Kit - Complete Package! The Ham Radio Starter Kit is your discount ticket to the exciting world of amateur radio! Compiled by hams for hams, this kit has everything you need to get you started as an amateur radio operator at minimal cost! 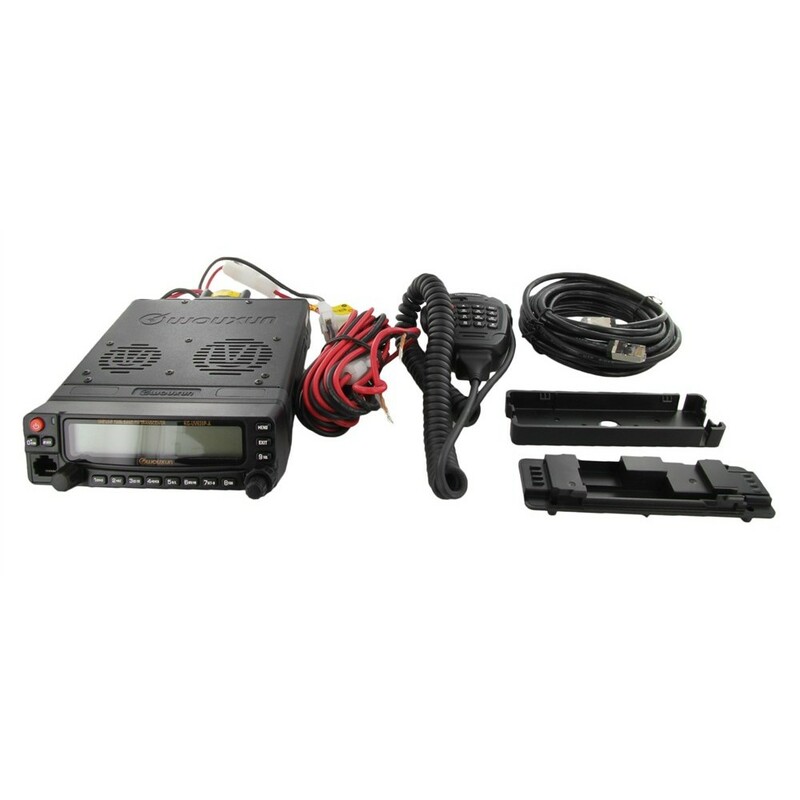 The Ham Radio Starter Kit Mobile/Base Station Edition is a great training package for an amateur radio club Technician License class or instructional program. It comes in handy for a new hams who are just getting started and want to build a ham shack on a budget. It's the perfect gift for that ham in your life who wants a mobile or base station radio to Get On The Air. Want a ham radio package that has it all? This is the kit you need! 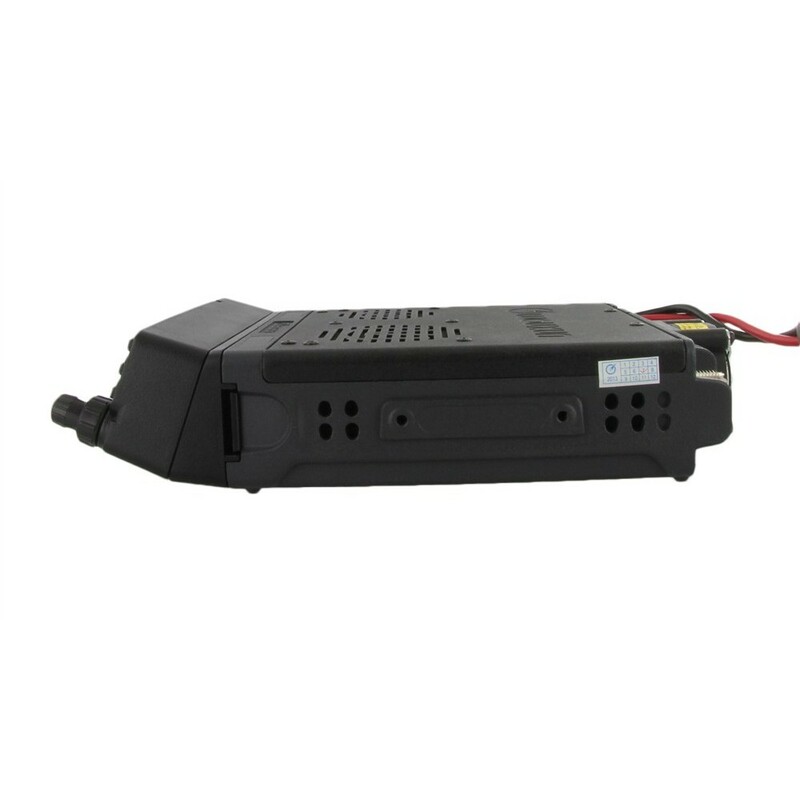 -2 out of 3 radios came with issues: one had a boot issue and another had a fan that would run continuous as soon as power was supplied whether the radio was on or off and with or without the faceplate. BUT I've seen issues like this with other radios and, generally, once you get a working radio they tend to last forever. I already have one that's been installed in my truck for at least 6 years and no issues. The features these radios come with are well worth the hassle of a possible lemon. They are jam-packed with the features of a $600+ rig. -Clear transmissions reported on a NMO 2/70 antenna, though range is limited with this particular setup. -Excellent reception from distant repeater stations -Audio volume is an issue with these radios across the board. It goes from dead quiet to about 50% volume when going from level 2 to 3, but good news is that it's LOUD. -The mic has a good quality feel to it and it does have its own built-in speaker WITH its own potentiometer, so that's 3 separate speakers on this thing. Also has option to connect your own in the back. -Remote faceplate location setup is a perfect fit for my setup. Radios are installed behind the cabinets (with good airflow) while the faceplates are relocated at the desk. A must-have for my setup. -Easily converted this setup to a full-time repeater mode. -Wasn't too impressed with the programming software. This Wouxun KG-UV920P-A was advertised as a customer return that had been bench tested. I contacted the company and they shared bench testing results with me. I purchased the item based on their answers at a very reduced rate. When I received it, it was in the orginial packaging including some of the screw packs that had never been open. It looked, felt operated and setup like a brand new radio. Had all the instructions and accessories included. I have mounted the unit in my RV and used it several times and have gotten nothing but positive comments back on the quality of my transmissions. The reception is also excellent. Very pleased with my purchase and would recommend this radio to anyone needing a inexpensive mobile or second radio. I did not have good luck with these radios. They worked good, when they worked. 1st one stopped transmitting before 1 year, BuyTwoWayRadios warrantied it which was good. Second radio lost transmit on 440 side after about 6 months. BuyTwoWayRadios would not warranty this time, not sure why. I contacted Wouxon, and they suggested that I go to a service center, which they told me was BuyTwoWayRadios, however they told me they dont work on them. Overall, I would be cautious with this radio as the support and service behind it is not great. Good luck! I was excited to get my first radio being a new HAM. I received the radio, and was up and running fairly quickly. Over the first couple of weeks, I noticed the display had started changing characters to other than I had programmed. I sent the radio back , received a new one, and not more than two weeks later, it started happening again. I am now waiting for it to return for a second time. In the meantime, I had to purchase a replacement radio, adding to my frustration. I really like the changing of colors the way you want. I find it easy to program a frequency manually. The speakers work great, I really don't need an external speaker. Worked best for me to program 1 repeater in test reception then use software to put the rest in. I bought the KG-UV920P as a replacement for a much older Kenwood TM-733. Yes, I know the V-71 is out there, but I wanted to give the Wouxun a try. I am not disappointed. Audio reports are great, and the radio is an snap to program with the RT Systems software. I'm not as radio-active on the ham bands as I used to so this gives me a great bang for the buck. PROS: Everything is included; even the remoting cable and radio mounts. Most everything can be controlled through the hand held speaker mike vs. the front panel. CONS: I haven't figured out if there is a brightness control for increasing the illumination of the front panel, but that would be a big help with these bright Southern days here. That's about it. I was on a budget for a mobile rig, and this one fit the bill. I have been very happy with the performance and get reports of good audio quality from other hams. The speaker in the mike is a nice touch. I also like its ability to operate across all of it's frequencies. I have been using it daily with no issues. This product was shipped promptly, was well packaged, and arrived complete as advertised. Being new at this, I immediately sought help from my local "ham" club. They knew well the capabilities if the radio and power supply, and the near worthlessness of the accompanying program software! After purchase if adequate software, and club member assistance, I am on the air and enjoying my Wouxun Starter Kit - Mobile/Base Station. This radio is mounted in my truck. The remote mounting face plate is really nice. Radio is mounted under my seat. Radio is solid. This is my third radio from Cricket Ventures. Very satisfied with the service. They went out of their way to exchange and upgrade another, fourth radio I purchased. If, after programming the transciever, you discover you can access repeaters, but receive NO audio, try deactivating the PL function on the receiver. Some repeaters use the PL on the input signal only. product was shipped on the same day that I ordered it. I use it at home with a Tram 1185 on a cookie sheet and can hit several repeaters with no issues. I purchased this in a kit with a power supply for my home station. Works better than expected! The radio works well both for simplex and working repeaters. Is subject to some computer noise but then again aren't all radios? My experience so far is that you get a lot of radio for the money so it's a decent buy. Great radio once it's programmed. Love the cross-band repeat function. Use it all the time while hunting. I love this mobile!!!!! To me, I think it makes Yaesu, Icom, and Kenwood chunk their pants! The reason I chose this over the Yaesu 7900 was the full duplex and cross band repeat functions. Has full quieting crisp clear transmit and has gone well over 100+ miles with my Ed Fong Ebay antenna on 50ft new rg8x soldiered coax. 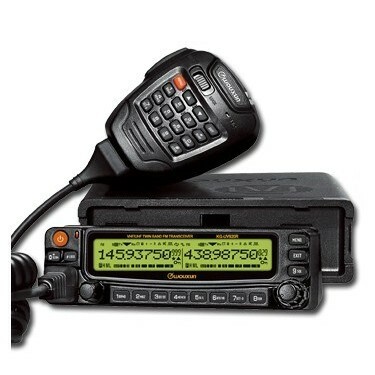 I would recommend this product to anyone who needs a good mobile with all the bells and whistles but cannot afford a high end price tag as with a Yaesu etc. 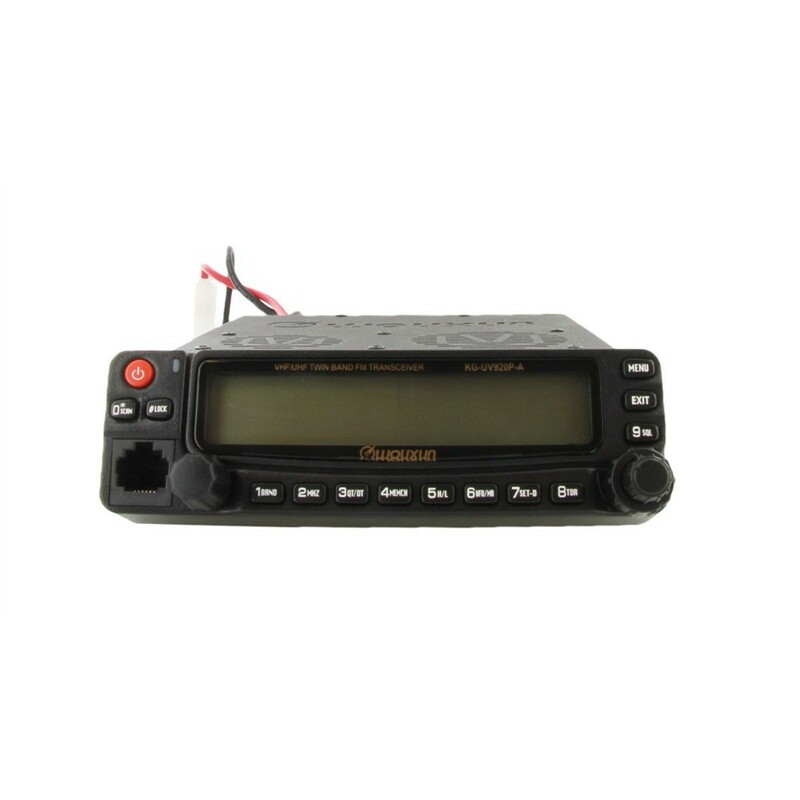 My next purchase will be the UV950-P Wouxon Quad bander so VHF/VHF Repeater functions can be used. Current VHF/UHF cross band repeat is awesome as well. So far so good and I have been using it for 3 weeks now with out any problems. I can easily make the Hazard repeaters on Low setting which is 5 watts and 40+ miles away as confirmed by Daniel KF4KPL net controller as well as Pikeville which is 50+ Miles away from my location on low as well! Harlan repeater located 23mi away is the same way on the low 5 watt setting with full quieting and full crisp, clear audio as confirmed by our club net president Wayne AF4YJ. Believe me when I tell you that I am in love with this thing! And I promise if you get one, you will be too! Be sure to get the programming cable if you want to fully experience what all this radio can do! Personally if it was included with the purchase price this radio would go from a super great buy to a unbeatable priced product, I am just that satisfied with it! I bought this radio three weeks ago, it copies well, however I have not been able to configure it to make one transmission. The documentation is extremely poor. This radio has proven to be fine for my uses. I don't need it for everyday use but so far it's been performing just fine for contacting others on the repeaters in my area. Currently, I use it in my vehicle but plan on setting it up for cross band repeat in my home but will need to research how to do this while meeting all FCC criteria for such an operation. Celebrate World Amateur Radio Day 2015! The new Wouxun KG-UV8D is coming soon!